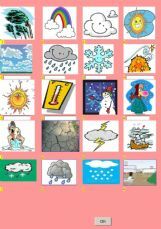 I´ve just tried the two exercises about the weather and I really think they are both good but the first one should be the second one. I think it´s easier to match first and write afterwards. Great work anyway. Have a nice day.